Volunteer Training Corps is a letter written by Arthur Conan Doyle first published in The Times on 3 december 1914. See also his first letter on the same topic: Volunteer Training Corps (28 november 1914, Crowborough Weekly). Sir, — The War Office has sanctioned the existence of those volunteer corps which are affiliated to the Central Association. They have accompanied this concession by certain conditions which are not unreasonable. There is one, however, which I earnestly hope that they will modify, as it greatly impairs the value of the movement. By this clause any man of military age who joins a volunteer corps promises in writing to enlist in the Army if called upon to do so. Under the present need few recruits this would make it appear the same thing to a man whether he enlisted in the home force or in the Army, since the first could compulsorily be changed into the second. The result is that such men now serve in neither. There are very many men of military age who are married and in business. Most of them could not possibly join the Regular Army, but would be glad to serve in the home defence force. At present it looks as if a trap were set for them, and so the country loses their services altogether. 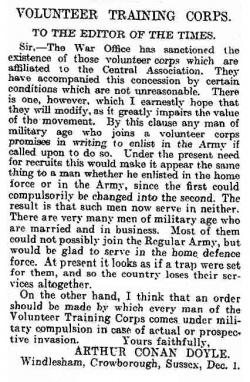 On the other hand, I think that an order should be made by which every man of the Volunteer Training Corps comes under military compulsion in case of actual or prospective invasion. Windlesham, Crowborough, Sussex, Dec. 1. This page was last edited on 22 July 2017, at 19:49.